How do you have more and less at the same time? The answer lies in the definition of more and less. You can have more, live a fuller life, and live abundantly while having less things, less to-dos, and less to worry about. A couple of years ago, I started to build my life around the philosophy of living Intentionally. I realized that I was doing things all wrong and essentially wasting my precious time on things that didn’t really matter in the end. I was always “busy” and always had a list full of things to do. I’m not sure I could answer that question then. But I can now. I was living a full life in the wrong way. I wasn’t being filled with the things that mattered; the things that really made my heart full and happy. I was filling my life with meaningless to dos that I thought I was supposed to be doing but in reality held no purpose for my life. They might have purpose for others but they didn’t for me. So when I flipped the switch and got rid of the extra stuff, I actually felt fuller. I am living more abundantly now than ever before and my to do list is shorter than ever too. I think this philosophy can be summed up by saying that I want to live being content with enough instead of strong for more. And that goes for every aspect of my life and business. I don’t want more of things that I don’t need in my life. I want to hone in on what I really need and harness that. I want to thrive with less and savor the things I have. We have grown up believing that more is always better but there has been such a huge shift towards less and I’m right in the middle of it. I used to be on the other side of the line, but it led me nowhere, and fast. With the approach of enough, I only make room for the things that truly set my heart on fire and forget the rest. Having enough doesn’t mean that you have to settle. You can still do what you want and have enough. It doesn’t mean you have to give up everything and live with next to nothing. It means that you have to define your limit and live under it. Don’t push yourself beyond it just because you think you can. In the end it will never be worth the stress of more. 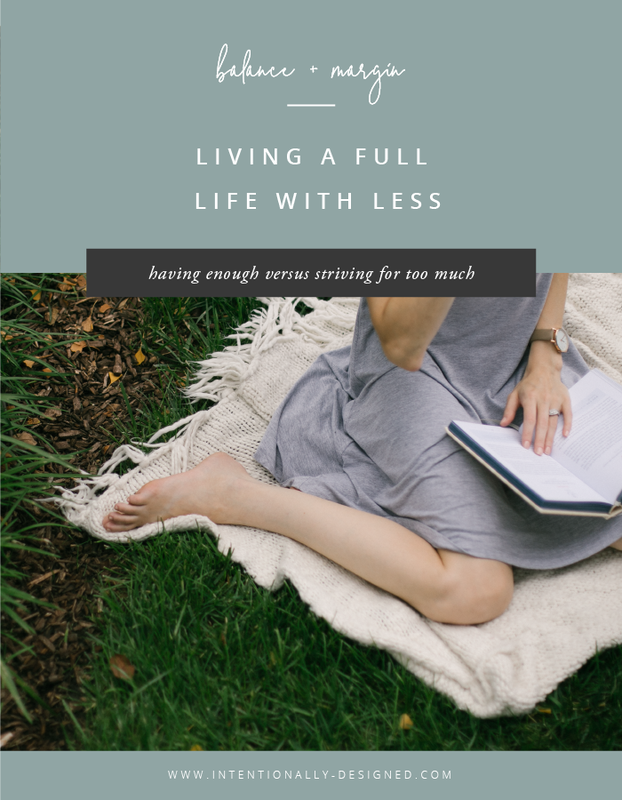 Living with less allows you to actually live your life. It gives you the time and margin to enjoy your life. It opens up the opportunity to be content with enough and only invest your time and energy on things that really matter to you. Are you living with enough or striving for more?